Linear Jewelry - This is a handcrafted pair of beautiful dangle earrings created from high polished square tubes of sterling silver that are accented by oval Smoky Topaz faceted gemstones. These are light and fun and shown pierced, but available as clipped. Handcrafted linear sterling silver pierced earrings. These earrings are accented by oval faceted smoky topaz stones, but are available with any of our other stones. These earrings are a perfect compliment to our linear necklaces. Available also with clips. 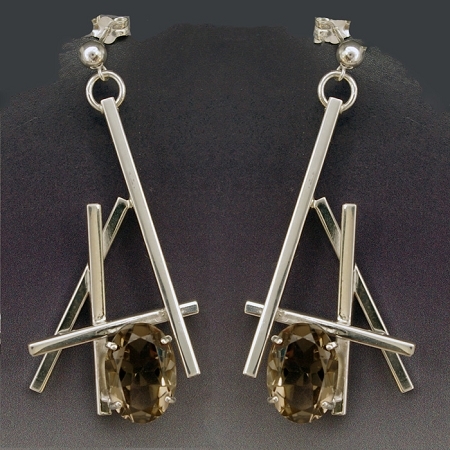 These earrings are signed and created by Aaron Rubinstein of Modern Art Jewelry.